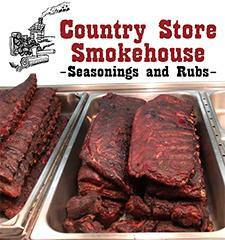 Our Country Store Smokehouse features freshly-prepared products including spareribs, baby-back ribs, pulled pork, chicken, pork tenderloins, baked-beans, potatoes and sweet potatoes. It's not unusual to also find us trying-out something a little bit different. Just stop-in to see what we're experimenting with. Smokehouse products are available every day of the week in our Smokehouse cooler. They're also available fresh in our hot deli case on Saturdays in the winter...and both Friday and Saturday in the summer. We also offer three homemade varieties of barbeque sauce in our deli - including original, sweet bourbon and hot & spicy "sweet-heat". Looking to spice-it-up at home? Our Country Store Smokehouse also offers a significant retail line of bottled seasonings located in the meat department.